When it comes to fitting your bed with sheets, the old motto ‘Bigger is Better’ doesn’t apply. Now that shallow mattresses are becoming increasingly popular, as are low profile and platform beds, deep fitted sheets found in stores with pocket depths of 18” or more, make for a sloppy uncomfortable sleep surface. Even if you carefully tuck the extra material under the mattress and pull it taut for a military ‘bounce a quarter’ test, by morning you will have a rumpled bunched up mess to contend with, leaving you to tug and tuck all over again. Corner straps don’t seem to help much either. 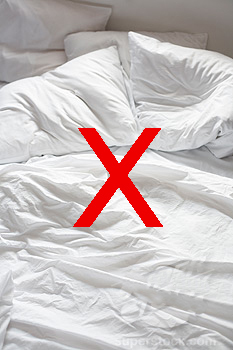 Although they work well in some situations, for this dilemma they only ensure that the sheet will stay on the bed and not pop off the corner in the middle of the night. So what’s the solution when all you can find are deep pocket fitted sheets? It’s simple. Cozytown Linens offers shallow pocket fitted sheets with pocket depths starting at 6” deep and are available in one inch increments up to 25”, allowing you to choose the perfect size fitted sheet for your mattress. There’s no more wrestling with sheets that are too big and baggy. Eliminate your frustrations and your sloppy sheets at the same time! Flannel is a wonderfully soft, fuzzy and warm fabric often used in clothing and bedding. It is a plain weave fabric typically made of cotton and comes in various weights. Unlike cotton bed sheets which are measured by the thread count, flannel fabric is measured in ounces per square yard. Higher quality flannel sheets will have a weight of at least 4 oz. per square yard. Flannel is loosely woven and therefore tends to shrink more than regular cotton fabrics. You may notice this when purchasing flannel sheets – Manufacturers typically over-cut the fabric to allow for shrinkage, so they tend to be a little large when new, but after washing fit more snugly. Some flannels are brushed (napped) to create extra softness. Brushing or napping is a process where a fine metal brush gently scratches the surface of the fabric to create fine fibers from the loosely spun yarns. Flannel can have either short or long nap, and can be napped on one or two sides. Double-napped flannel refers to a fabric that has been brushed on both sides. Flannel has become an American staple for cotton pajamas, robes, men’s shirts and bedding. It is typically a seasonal item and much more readily available in the cooler months. Sateen and percale fabrics are widely used in bedding products. Contrary to what many people believe regarding sateen and percale, each are a type of weave. Sateen is commonly misunderstood as being a finish that gives the fabric its sheen, but in fact the sheen is the result of the milling process. Fabrics consist of threads of yarn that are woven vertically and horizontally together. Warp threads run vertically up and down the fabric, while weft threads run horizontally. The thread count is derived by the number of threads going in both directions inside one square inch of the fabric. Percale fabric is typically no less than 200 threads per square inch (200tc) and can be a cotton polyester blend, 100% polyester or 100% cotton. Woven with one thread under, one over, it creates a stronger, crisper fabric. Sateen is a type of weave that places most threads on the surface (four over and one under). It has a luxuriously soft silky feel, although it tends to be less durable than percale. The bedding industry standard today tends to be toward sateen. Although percale bed sheets are still available, sateen has taken the lead in becoming the most widely used bed linen fabric. Shoppers often experience confusion when deciding whether to buy organic or non-organic food. Organic food tends to be more expensive and sometimes less perfect-looking, however the wonderful benefit is that organic foods are not exposed to harmful chemicals. Before making a decision on what to buy, it is helpful to be informed about what makes a particular food organic. Organic food refers to agricultural products, such as fruits, vegetables, grains, dairy, or meat, for which farmers use alternative growing and processing methods. Organic food is fertilized using manure or compost instead of chemical fertilizers, which is the norm for non-organic farming. To protect crops from insects, pests and other diseases, organic farmers employ mating disruption methods, traps and even other insects or birds. Non-organic farming methods depend on sprayed pesticides which are harmful to our health. To produce organic meat, livestock is fed with organic feed and allowed to graze freely in chemical free pastures. In contrast, traditional livestock farms use non-organic feed and depend on antibiotics and growth hormones to manage the development of livestock. In turn, these antibiotics and hormones end up in our bodies, causing all sorts of ill health affects. Be sure to check labels and don’t be fooled by products marked as ‘All Natural’. All natural does not mean organic. The Food and Drug Administration (FDA) regulates the term ‘natural’ only as it applies to added color, synthetic substances, and flavors. According to the FDA, natural foods are processed without preservatives, dyes, or additives, but may have been grown with the use of pesticides, hormones or other conventional methods. What harm do these chemicals do? Side effects from these harmful chemicals and hormones can include endocrine system failure, infertility, birth defects, arthritis, vision problems, insomnia and cancer, just to name a few. Many times these ailments are falsely diagnosed and attributed to aging, disease, or simply unknown causes. Little do we realize, we are self-poisoning our bodies. Since organic foods are more expensive, most times it is impossible for the average income household to substitute the entire grocery list with organic foods. In this case, start with just one or two items. 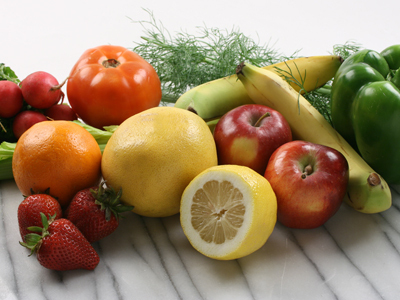 If you eat a lot of fruit, consider buying a couple of organic fruits, especially those that you eat most often, or you can substitute one meal per week with organic foods. 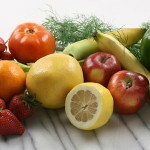 Eliminating a small amount of harmful chemicals from your diet is better than doing nothing. You may not notice a difference right away, but in the long run your body certainly will.